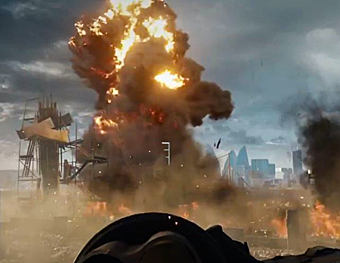 EA revealed the new Battlefield game at GDC 2013. You can watch the same 17-minute trailer online that the press was shown in an AMC movie theater, but imagine the power of the new Frostbite 3 engine blown up huge on a movie screen. Seagulls weave in circles in the sky and the motion is smooth and organic. When we take cover behind a cement block, the gradations of light and shadow in the pockmarked surface are subtle. The God beams from the setting sun are soft and diffused. When the squad attempts to make their escape in a stolen car by speeding down a road that lies next to a river, the mist sprays onto the windshield and congeals into thick drops. And when the Americans finally shoot down the Russian gunship, it pinwheels into the ground, peppering the Americans’ escape vehicle with a shower of macadam that is as fine a demonstration of particle physics as I’ve ever seen. The graphics are fantastic and next-gen, but the action is staid and played out. Try watching the trailer on anything other than an HD monitor. Concern yourself with the substance of what’s in the frame, and not how it looks. We may as well have been watching something out of Battlefield 3. The demo was the target of skepticism and sometimes harsh derision from other journalists as we exited the theater – and I would blame most of that on the presentation by Patrick Soderlund, executive vice president for EA Games – immediately after the demo ended. Soderlund talked about a new era of interactive entertainment – quality, innovation and passion – and new ideas and ways to entertain people. 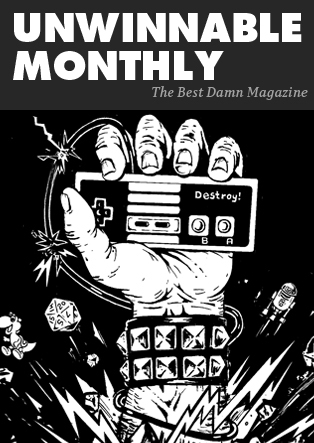 The best games are not about polygons or shaders, but emotional connections to the player, he said. “Technology has allowed us to become better storytellers,” Soderlund said, extolling the stress of the moments we saw in the demo, and the sense of imminent danger that is “very real, and very human.” But it wasn’t, not at least in the eyes of the journalists covering the event. We’ve been there and done that. Our cynicism may have been born from hearing a similar pitch from Greg Goodrich at last year’s GDC reveal of Medal of Honor: Warfighter and his talk of authenticity and human stories. In the end, we were handed a game that delivered on none of those promises. When I sat down with Patrick Soderlund later that evening, I asked some obligatory questions about the technology. Yes, the demo was running on a high-end PC. No, the Frostbite 3 engine scales very well but of course you will see a difference between a console’s performance and that high-spec PC rig. Then we talked about story. There’s a moment in the demo where a squadmate named Dunn is trapped under the wreckage of a building that has just collapsed around the American squad. The player is given the choice to either cut Dunn’s leg off at the knee or not. In the demo the player decides to make the cut. It’s tastefully presented, it’s clearly meant to be an emotional moment, but it also makes me think about Spec Ops: The Line, a critique of the way military shooter players have become desensitized to the violence in military shooters. This moment in the Battlefield 4 demo may be cut from slightly stronger stuff than we’re used to in the Battlefield franchise, but it’s still a much slighter act of violence than what the player will commit throughout the rest of the game. I brought up Spec Ops to Soderlund and suggested that cutting off a soldier’s leg might not be shocking at all to a veteran of military shooters. Are EA and DICE aware of what Spec Ops means to point out, and are they designing Battlefield 4 with that desensitization in mind, I asked? His answer was a dodge, but in the absence of seeing the final product there was no room to push him while also being reasonable. It’s a 17-minute demo. 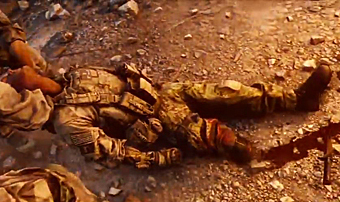 The choice of cutting off Dunn’s leg may hold no significance and thus no emotional power to an audience that is used to gunning down hundreds or thousands of people in the space of a single military shooter campaign, but perhaps there will be other choices in Battlefield 4 that do carry an emotional component and that may resonate with even the most seasoned mil-shooter audiences. I doubt it. Battlefield 4 is being released into a games industry that feels like it has changed significantly in a short amount of time. The Games Developers Choice Awards mostly shunned triple-A titles for games with more substance. When it comes to emotional experiences in video games, the rules have changed. I asked Soderlund if he thought games like The Walking Dead had raised the bar on forging emotional connections between videogame characters and players. The question is how much different the Battlefield 4 experience is going to be based on these sorts of choices. Could we expect the Battlefield 4 single-player campaign to change, in any appreciable fashion, based on whether or not we cut off Dunn’s leg? The experience of The Walking Dead changed in meaningful ways as a result of our choices. The idea of having even a vaguely similar experience in Battlefield 4 is difficult to swallow in the absence of any demonstration to prove the point. So much of the demo presentation and my conversation with Soderlund afterward were concerned with Frostbite 3 as a tool for storytelling. 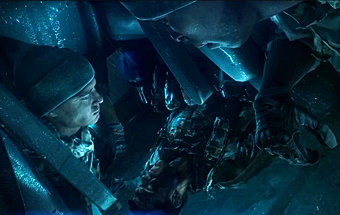 Frostbite 3 is about visual fidelity and seamlessly blending motion capture performances, hand key animations and AI and the ability for the team at DICE to mimic film techniques like anamorphic lens flares (something which Soderlund brought up several times), none of which have anything intrinsically to do with good storytelling. That’s the lesson that Journey, arguably the most emotional videogame experience of 2012, taught us. It had beautiful art and flawless technical performance, but the art was simple and the game played so smoothly because there was nothing extraneous mucking it up and getting in the way. So I asked Soderlund what games like Journey tell us about the relationship between technology and emotional game experiences. The first part of Soderlund’s answer is precisely the case. Emotional game experiences are not about production budgets and high-end graphics performance. When I asked Soderlund whether we were going to see the private lives of the soldiers in Battlefield 4, or meet their families or be given any other kind of emotional touchstones to really get to know the characters, I was told no. The game will focus on the soldiers in the field. 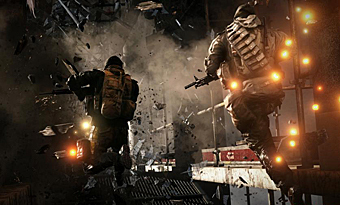 Delving into their private lives is the sort of thing the audience needs to set the characters of Battlefield 4 apart from every other collection of modern military squadmates the Call of Duty or latter Battlefield games have offered up. Presenting those squadmate tropes in higher resolution is not enough. Being under enemy fire together is not enough. Combat alone does not make for an emotional bond with AI squadmates, or else we would have been talking for years about how military shooters are emotional experiences. We don’t, because they’re not. Dennis Scimeca is a freelance writer from Boston, Massachusetts. Follow him on Twitter for a deeply emotional experience @DennisScimeca.